At Uniphar, we recognise our responsibility to our employees, shareholders and the wider community. Being responsible is at the core of our business strategy. We demonstrate who we are and what we want to achieve in everything we do. In 2016 Uniphar are proud to sponsor C.R.O.S.S. cancer research The Friends of CROSS are a voluntary group, whose purpose is to raise Cancer awareness throughout Ireland, with a special emphasis on Cancer education and awareness within the youth community. 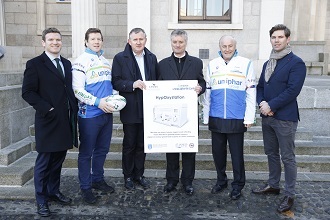 Supporting CROSS (Cancer Research) and the work of our colleague, Professor John Reynolds and his teams in St. James’s Hospital and Trinity College, Dublin, the Friends of CROSS are also committed to raising funds for the purpose of Cancer Research, Prevention and Treatment. Friends of CROSS deliver their objectives through interactive, fun based, inclusive community events that are Rugby and Sports themed, promoting healthy living and lifestyle. All profits generated through this activity are forwarded to CROSS for the benefit of cancer research and related treatments. 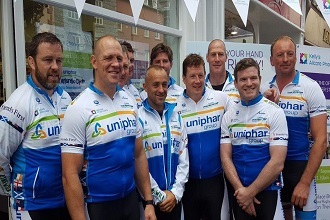 Uniphar Group were delighted to announce that they raised over €100,000 in funds to go towards C.R.O.S.S in December 2016. Funds raised will go towards purchasing hypoxic chambers for use at St James’s Hospital, our cancer research centre of excellence in Ireland. This years target equipment is to purchase hypoxic chambers within our Institute that can be used with the Seahorse machine kindly funded by the cycle the previous years. What can this equipment do?. As a tumour grows, regions of the tumour gets deprived of oxygen, this then allows the tumour to grow more blood vessels, feeding the tumor and ultimately allows the tumour to become more aggressive and cause cancer spread. This state of the art equipment will allow us to mimic the reduced oxygen levels (hypoxia) found in patient tumours and see this effect on response to radiation, chemotherapy and the ability of tumour cells to spread. Uniphar are committed to giving back to our community by our continued partnerships with the Special Olympics, and Friends of Cross Charity. Community is at the heart of our people and our culture within Uniphar. During 2015 staff ran a series of fundraising events to generously raise over funds for local charities including Run-a-muck, Barretstown, Focus Ireland Christmas, Breast Cancer, Temple Street Bake Off, Save the Children, and DEBRA Ireland. Uniphar Group is committed to adhering to the highest standards of all statutory requirements, ensuring minimal impact to the local community and our environment. 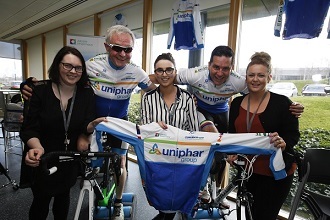 Since 2013 Uniphar Group have committed to improving its carbon footprint across the organisation. We have continued to invest in technology to monitor and manage our energy consumption, enabling initiatives such as fresh air free cooling to control our temperature controlled warehouse. Uniphar have and continue to be dedicated to adopt innovative technologies and controls to reduce our carbon emissions. Uniphar has adopted a green culture through its people and process and proud to have a 97% recycle rate of all waste from our 7 facilities. At Uniphar Group we are committed to providing the best possible workplace for all our employees. Creating a safe and enjoyable environment is an essential element of our people strategy. 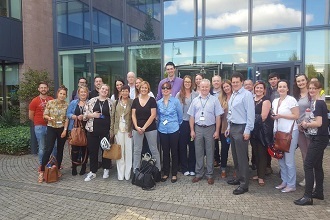 Recent initiatives include the launch of an Employee Well Being programme to support Work Life Balance and other aspects of busy lives. Our people are our greatest asset. Uniphar Group is comprised of excellent people working across every area of the business with the shared goal of achieving the best results for our customers and our company. Our ability to attract, develop and retain talent at every level is crucial to the success of our organisation. Uniphar will continue to work towards creating the conditions within which employees can flourish and achieve their personal best. Uniphar is committed to a culture that embodies the values that bring out the best of every employee. We reward integrity, teamwork, innovation and achievement. Our goal is a high-trust and high-performance organisation that benefits each of us and all of our stakeholders. Sustaining high quality delivery of key products and services to our customers is key to our long-term success. Uniphar Group’s reputation is in the marketplace, both for delivery and integrity, is an essential component of being a responsible business.